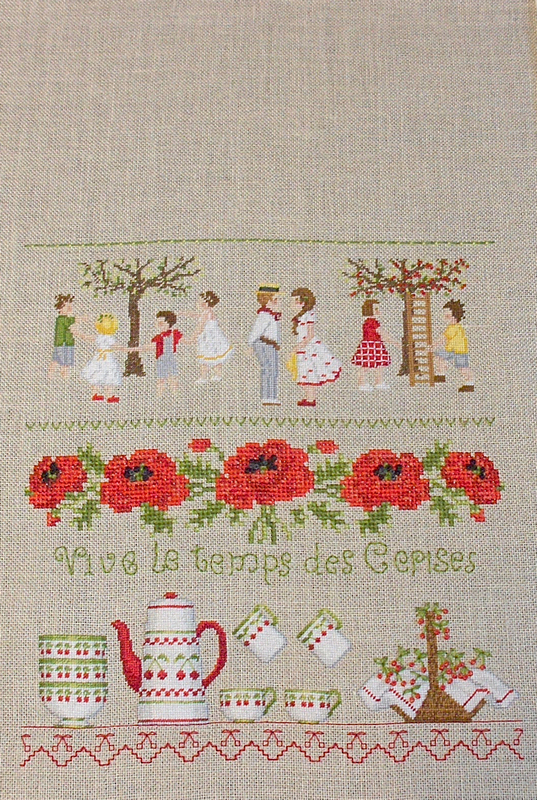 As you can see, I am really starting to gain some traction with this Juin sampler from Bonheur des Dames. Last month I was just starting the petit point band with the young people and the cherry trees. Now they are close to finished. There is still a lot of picky stuff to do, including the micro backstitching which is done over one thread on the petit point sections. The next section will be cross stitches again. 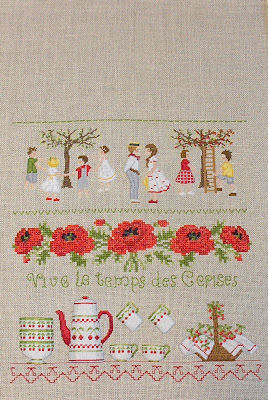 The row of poppies is also cross stitch, and I had them done in three or four days, so who knows? I may be finished soon. It will be great to finish it, because this UFO is about eight years old. But now that I've figured out how to handle all the ends on the back of the petit point, it has been a lot of fun. I'm looking forward to the next one! Thanks, Katherine! I'm hoping to post some close ups soon.